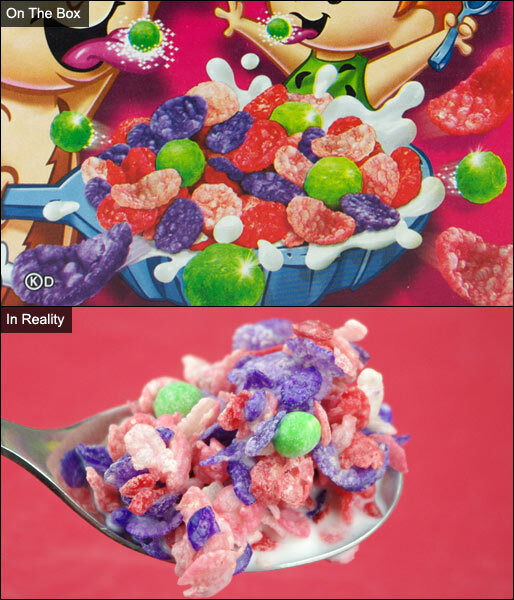 This cereal is made up of red, pink and purple Pebbles-shaped pieces and tiny green balls that are meant to fizz in your mouth like Pop Rocks candy. I'll admit to being a little excited about this one. I never got to try Powerpuff Girls cereal from 2000 which also "fizzed in your mouth". This was finally my chance - 14 years later - to have a cereal fizz in my mouth. At first, I didn't notice the Poppin' but as I ate more, I started to notice that little popping sound in my mouth that I remembered from the heyday of Pop Rocks. Unfortunately... to notice the fizz, you have to interrupt your eating and sit quietly with a spoonful of soggy cereal in your mouth. 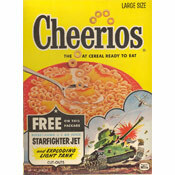 If you just eat this cereal like a normal person eats cereal, you're likely to miss the experience. To really get Poppin' with this cereal, you have to isolate the green pieces and put three or four on your tongue. Only then, do you get a near Pop Rocks experience. Even then, it's a subdued fizzle. As for the general flavor of the cereal, it's fine. The box calls it "Bursting' Berry Flavor". I'd call it a pleasant, familiar berry flavor. You can't isolate the flavor of any particular berries. It's just general berry flavor. Unfortunately, I think this cereal fails at what it was trying to do. 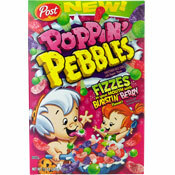 The box shows Pebbles and Bamm Bamm smiling with fizzing cereal pieces on their tongues. That would suggest that consumer could have a similar experience. That isn't really the case unless you put yourself in an almost zen-like, quiet state. In short, the fizzle lacks sizzle, my nizzle. Nutritional Considerations: Each 3/4 cup serving has 120 calories, 1 gram total fat (1 gram saturated and 0 grams trans), 0mg cholesterol, 150mg sodium, 26 grams total carbs, 0 grams dietary fiber, 10 grams sugar and 1 gram protein. What do you think of Poppin' Pebbles?